You are who you eat! For zombies in the world of The CW’s iZombie television show the only downside to being undead – besides the whole “eating brains” thing – are the personality shifts that come with every new brain they eat. Based on the popular DC Comics TV show, this new iZombie Minimates 2 Pack features medical examiner Liv Moore and career criminal Blaine DeBeers. 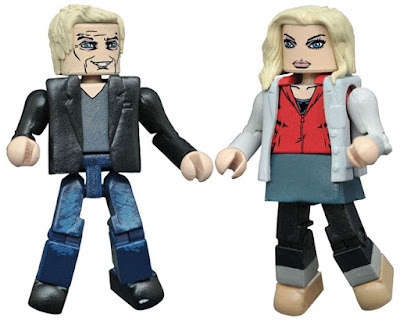 Each iZombie Minimates 2 Pack includes two 2” mini figures featuring 14 points of articulation and a variety of interchangeable parts and accessories. Collectors can pre-order this awesome set now at Entertainment Earth for $9.99 here.